In the daily and long-term management of our grounds and buildings, we maintain high standards of sustainability and energy conservation, and strive to continue improving. One of the most impactful ways we demonstrate our long-term commitment is through our recent green construction projects. 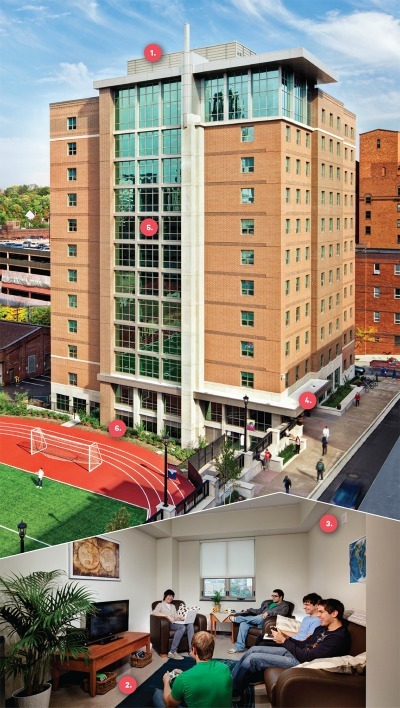 Design and construction at Duquesne are guided by our commitment that all new construction and renovations to existing buildings follow green methods. Des Places Hall, a student residence opened in 2012, has attained Gold LEED certification, and the newest building on campus, the Genesius Theater, has energy efficient lighting, low flow water devices and a highly efficient heating and cooling system. A light-colored roof covering retards heat buildup, and rooftop solar cells generate electricity. Carpeting, flooring and ceiling tiles are made from recycled material. Speaking of recycled material, 75 percent of the brick, stone and concrete produced during the demolition of the existing building was used for engineered fill for the foundation of the new building and promenade. Temperature controls are found in each room, and a ventilation/heat recovery unit saves energy in cold weather and cools and dehumidifies incoming air during warm periods. Energy-saving LED fixtures illuminate exterior entrances, sensors switch off room lights in unoccupied rooms and regenerative motors produce electricity when elevator cars descend. Floor-to-ceiling windows with photosensitive shades maximize natural light and window tints vary by location, with the darkest tint on the building's west side and the lightest on the north. Landscaping in the area surrounding Des Place Hall features low-maintenance, drought-tolerant plant species. Water-saving toilets in each room or suite conserve water, and high efficiency dryers and high capacity washers that use half the water per load as a normal washer are on each floor. Get the full report (PDF) to learn more about Duquesne's sustainable campus operations practices.